How would you survive the Dead Days? Riley Jameson is a regular guy. A little hard-of-luck and going through a rough time at work, but nothing he can’t handle. That was before the creatures rose. Feasting on human flesh, their hunger is insatiable. The zombies are unstoppable. The police are gone. The government has collapsed. The world as Riley knew it has changed, forever. In this new, terrifying world, Riley is forced to think quick and act fast in order to survive. As he encounters numerous skin-crawling scenarios, his morals are pushed to the very limit, forcing the question: can humanity survive the onslaught of the dead, not only on the outside but on the inside? 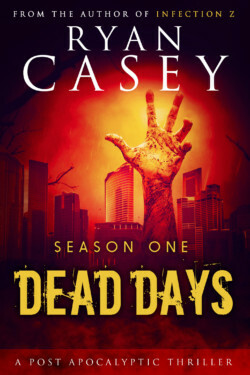 The answers often prove unsettling in this unique zombie apocalypse series unlike any other.